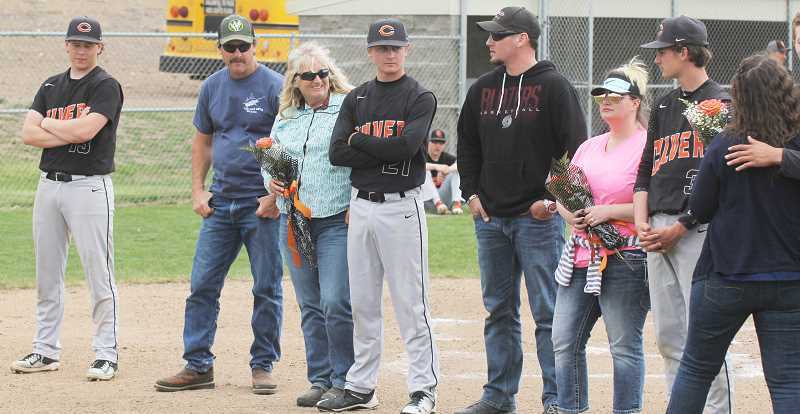 The Culver Bulldogs lost both games in Saturday's double header, but will host a play-in game, Friday, May 11 at 4 p.m.
Culver baseball (10-7 overall, 6-3 in league), could not beat Sherman (14-2 overall, 9-0 in league), losing both games in a doubleheader on Saturday. The Bulldogs celebrated their senior night between games, recognizing seniors Cole Little, Jordan Bender and Weston Basl, just prior to their last regular season home game. The Bulldogs lost 6-0 in the first game and 12-5 in the second. Cole Little pitched most of the first game for the Bulldogs. Little pitched six innings and struck out four batters. 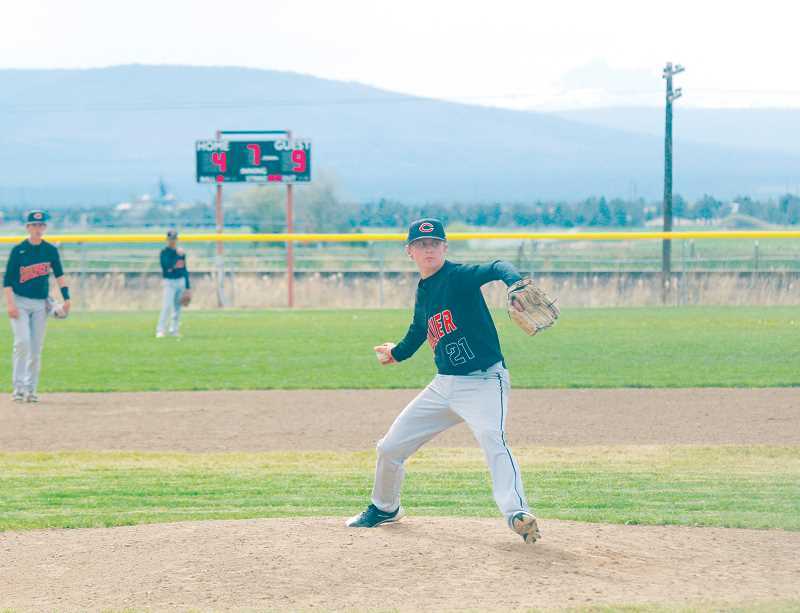 Tadd Anderson also pitched one inning for Culver and struck out two batters. Sherman took a 1-0 lead in the first inning. The Sherman batter hit a deep ball to center field for an RBI single. Jamal Ortiz hit a shot in the gap of center and right field in the second inning, but Culver could not drive him home. In the top of the third inning, Sherman scored another run on a big hit down the right field line for an RBI double, putting Sherman up 2-0. Sherman managed to score two runs in the fourth inning, hitting a ground ball between first and second, giving Sherman a 4-0 lead. Anderson hit a line drive to left field for a double in the bottom of the fifth inning, but again, the Bulldogs could not get any more hits going, and remained scoreless. In the top of the seventh inning, Sherman hit the ball to shallow center field, scoring two more runs, taking a 6-0 lead. Anderson hit a line drive to left field for a single in the last inning, and was left on base, as Culver lost the first game 6-0. The second game for Culver was better offensively, with the Bulldogs recording six hits and scoring five runs, but Culver could not stop the hitting power of Sherman, which scored 12 runs. Cord Gomes and Bender both pitched for the Bulldogs. Gomes pitched six innings and struck out five batters, while Bender pitched one inning and struck out one batter. Culver and Sherman were both held scoreless in the first two innings of the game, but Sherman had a monster fifth inning, scoring five runs. The first run came from a Sherman batter getting hit by a pitch with the bases loaded, for a free walk home. Sherman scored another run off a Culver error, and a big hit to right field for a double scored two more runs. A grounder past third scored the fifth run in the inning for Sherman, giving them a 5-0 lead. Culver fought back in the bottom of the fourth inning, scoring three runs of their own. Freshman Trevor Smith hit a three-RBI line drive double to left field, cutting Sherman's lead down 5-3. A Sherman batter hit a solo home run in the fifth inning to shift the momentum back to the Huskies. Sherman wasn't done, as they scored two more runs, one from a ground ball hit between first and second and the other a free score from a balk. The Huskies took an 8-3 lead after five innings. In the top of the six inning, Sherman hit a line-drive triple to right field; during the next at-bat, the runner tagged up and made it home after a pop-up to right field. A Sherman error helped Tadd Anderson reach third base; he was sent home on a ground out to short from Joe Russo. The Bulldogs shortened Sherman's lead to 9-4, after six innings. The Huskies scored three runs in the top of the seventh inning — the first run was scored off of a Culver error and the next two, from a base hit to shallow left. In the last inning, Ortiz hit a ground ball up the middle for the Bulldogs and Gomes hit a double in the gap of right and center field, putting runners in scoring position. Smith hit a pop fly to center field for an out, but Ortiz tagged up and scored a run. The Bulldogs lost 12-5. Smith ended the game with four RBIs and a double. Basl, Gomes, and Anderson each hit a double and Ortiz hit a single. "I though we pitched well, but we need to hit better," said coach Shea Little. "We need to take care of those little errors, but they are a good team, with a solid lineup. "If we want a victory next week, we need to fix all those things and get better." "For our last regular season home game, that was a tough one to bite off," said Jordan Bender. "We still get to move on to districts, so we have to keep going. We need to clean up the small things, the little things and get the bats going. We had a ton of kids on base, but we just could not get them home." "We all have stuff to improve on, work on our bats in practice," said Cole Little. "We need to get back to the way we were hitting before. Right now we are focused on the playoffs and making it to state. In this week's practice, we are going to approach it harder than we have the whole year, because we need to take it to that number three team on the other side of league." The Bulldogs will host a play-in game on Friday, May 11, at 4 p.m. The team has yet to be announced.